Venice’s Osteria Alle Testiere is one of my favorite dining spots in the world. I repeat, in the world. Alle Testiere is small, cozy and always packed. Getting a table is nearly impossible so plan and reserve ahead. You’ll be rewarded with one of the best, most authentic cuisines of the world’s most beautiful city. The bustling area between Rialto and San Marco is rife with restaurants and bistros, and though it’s not quite the tourist trap it could easily be, few of the dining spots there are truly worthy of your time and money. Granted, Venice is so beautiful it has a way of making people forgive it for all its sins, but as one can eat divinely in the city, it’s a shame not to go where a memorable dining experience awaits. This is exactly the case with Osteria Alle Testiere, one of Venice’s best dining establishments, where the food is fresh, expertly prepared and true to this uniquely beautiful, down right magical, city’s history and roots. Co-owners Luca De Vita (the mâitre and head sommelier) and Bruno Gavagnin (the chef) have created a little jewel in Osteria alle Testiere. Actually, given how cozy and tightly packed the place is with Venetians and tourists alike at all times of the week, you couldn’t be blamed for thinking it’s not just little, but down right cramped (reportedly, the place is only 22 square meters large!). Cramped maybe, but a jewel nonetheless. In fact, I guarantee you’ll find that the other twenty-three people in the room (the place only sits about 24: travelling sybarites can take solace in the knowledge that there are two sittings a night, so there’s hope of snagging a table) will undoubtedly be all smiles and having just as great a time as you are. And so the atmosphere, rather than uncomfortable and strained, is jovial, warm and electric (though in the winter months you might want to ask for a table that isn’t right in front of the door, which never seems to stop opening, blessing all those sitting there with first-hand knowledge of Venice’s near-polar gusts of wintertime wind). 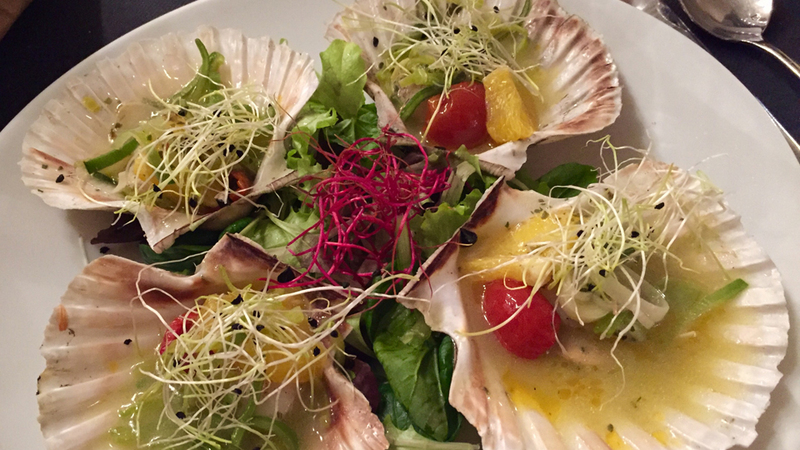 The sea and Venice have been inextricably linked for centuries, and so it’s not surprising that Alle Testiere serves some of the best seafood dishes in the city. Of course, it helps to have the Rialto market with its many fish-mongers nearby; and as at Alle Testiere nothing is frozen and stored, the menu changes not just daily, but sometimes within the same day, depending on what suddenly becomes available. The bistro-type food is very classic but often characterized, enlivened actually, by oriental touches (use of ginger, for example) that have long been staples of Venetian cuisine. Last but not least, Vinous readers will love Alle Testiere for its eclectic, outstanding wine list, brimming with small and high quality local, national and international wine producers of real note. Over the years, I have had many wonderful meals here but this last one was one of the best ever. Wave after wave of precisely cooked dishes highlighting exquisitely fresh ingredients found their way to our table, and even now, months later, I can still taste some of them. 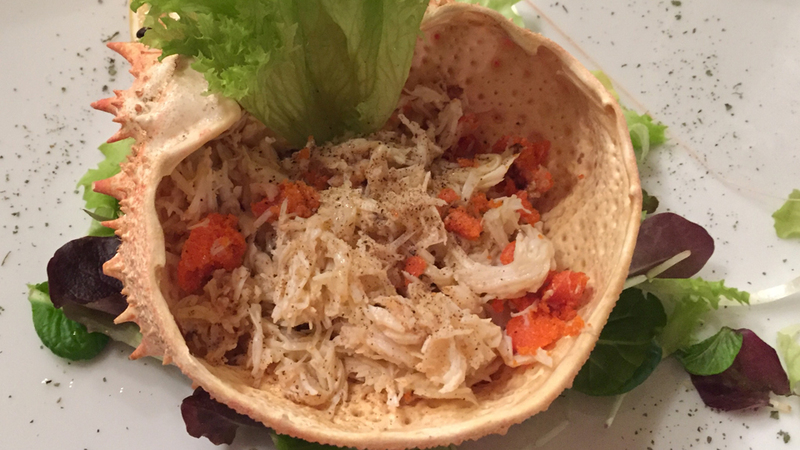 For example, the Spider crab Venetian style, which is found on menus in just about every restaurant in Venice, reaches, I dare say, an art form at Alle Testiere. On this night, the crab was one of the best, freshest and crispest renditions I have memory of. The scallops with orange and Cervere leeks were fleshy, briny and savory. 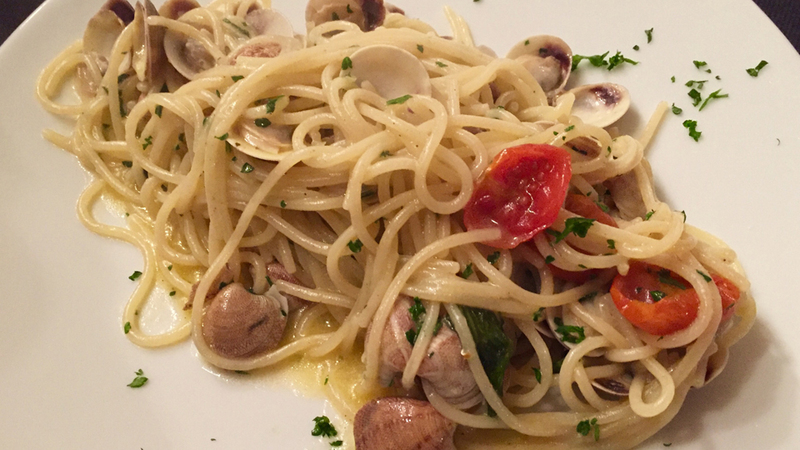 The artisanal spaghetti with Bevarasse clams (Spaghetti artigianali alle vongole bevarasse) is a must-order dish when in Venice as these particular clams are especially tasty and boast tons of flavor complexity. Not all clams are one and the same: in Venice, you have a chance to taste both the caparossoli and the bevarasse; the former are larger and darker in color, and are generally more expensive and even tastier than the latter. However, I hesitate to recommend readers jumping at the chance to try them, unless one knows a little something about caparossoli (and can recognize them). For one, there are the caparossoli of the northern waters of the Venetian lagoon (caparossoli dal scorso fin) that are much more flavorful and refined in taste than the more common caparossoli dal scorso grosso (more typical of the southern reaches of Venice’s lagoon). The real problem however isn’t the two different types of caparossoli you might come across, it’s the imported Philippine caparossoli that are now easy to catch and find, but that taste nothing like either kind of indigenous caparossoli. For this reason, I always recommend people try the bevarasse instead, because they don’t present food lovers with the same quandary. 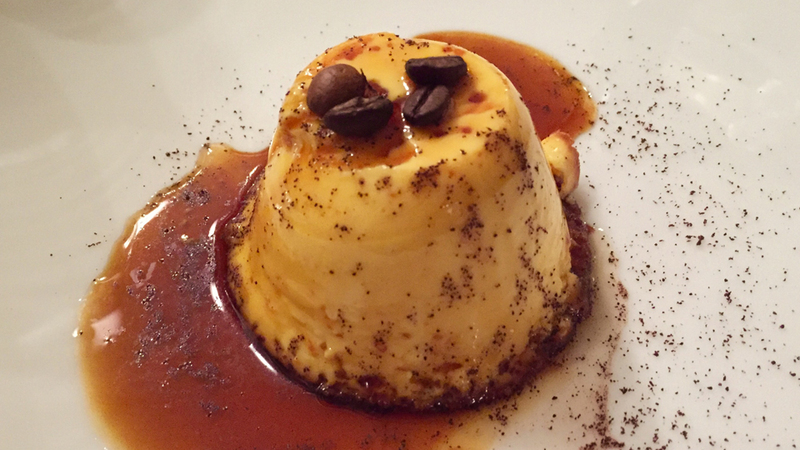 Last but not least, readers should be sure to try the Crema rosada alla Veneziana, the Venetian take on crème caramel, but lighter in texture. The 2015 Angelo Scaroni Bianco Edizione Limitata Viaggio delle Venezie is a curious 70% Pinot Bianco-30% Vespaiolo blend that is bright and savory, with strong hints of orchard fruit and herbs. It makes for a glorious, if uncomplicated, aperitif, but unfortunately, with less than 1500 bottles made a year, this is exactly the sort of rare local wine you can try only at Alle Testiere, short of visiting the estate. The winery is a unique outfit, founded by three wine-loving friends (an architect, an industrial designer and art director, and a pharmacist) who are quite adept at turning out idiosyncratic but tasty wines. 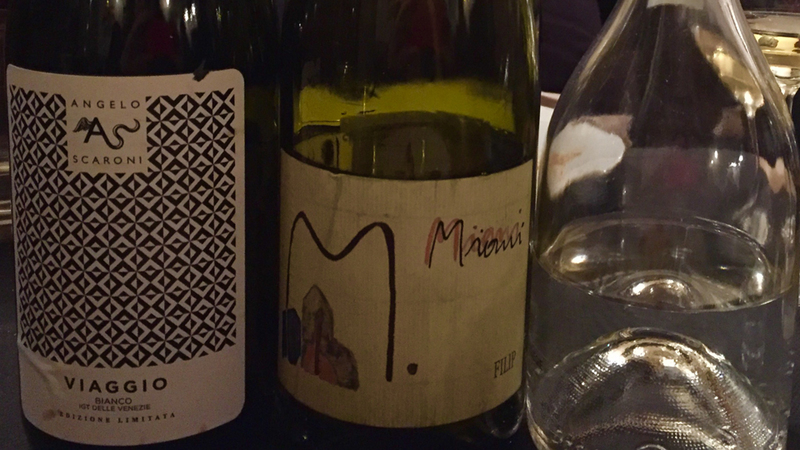 The 2013 Miani Friulano Filip is one of my favorite Friuli whites. This bottle was just as splendid as others I have had recently; it’s really one of the best recent Filip vintages in memory. Textured and deep, with melon, jasmine, orange blossom and peach aromas and flavors, this is one of the most successful vintage of Filip ever. And it matches quite well with some of the ginger and orange notes present in the various dishes of the night. Last but not least, a wonderful eau-de vie made from perhaps Italy’s best distiller, the lovely Capovilla distillato di prugne selvatiche Veneto made from the distillation of must of rare wild Veneto plums, a delicate, perfumed way to bring yet another wonderful meal at Alle Testiere to a close. My report on this latest dinner at Alle Testiere would be incomplete if I failed to alert readers to something else. On this night, I ate at the restaurant with a friend who reached the restaurant early, well before I did. Although the owner had no clue as to who was coming (the reservation was under her name), he found the time to go looking for Miani wines not on the wine list (my friend knows I absolutely love Miani’s Ribolla Gialla, and so asked if perhaps they might have had that wine too in the cellar somewhere). In fact, there were other Miani wines stored in a cellar in a nearby building; unfortunately no Ribolla Gialla, but De Vita did come back with two different vintages of the Friulano Filip, one of which was the 2013 we eventually chose to go with (it wasn’t on the wine list) when I arrived. Importantly, he took the time to do so even though the restaurant was already becoming packed and extremely busy. He could have very easily said he didn’t have the wine or the time to look for it as things were humming and hopping. In ultimate analysis, it shows he is going the extra mile for his clients that goes a long way in explaining Alle Testiere’s amazing, enduring, and well deserved success. Well done.